Phang Nga Bay is one of the most amazing places we had the chance to explore. We’ve been there countless times, by boat, car, on a bike, luxury yacht, longtail, kayak and even on a Chinese Junk. Each visit is a new experience. 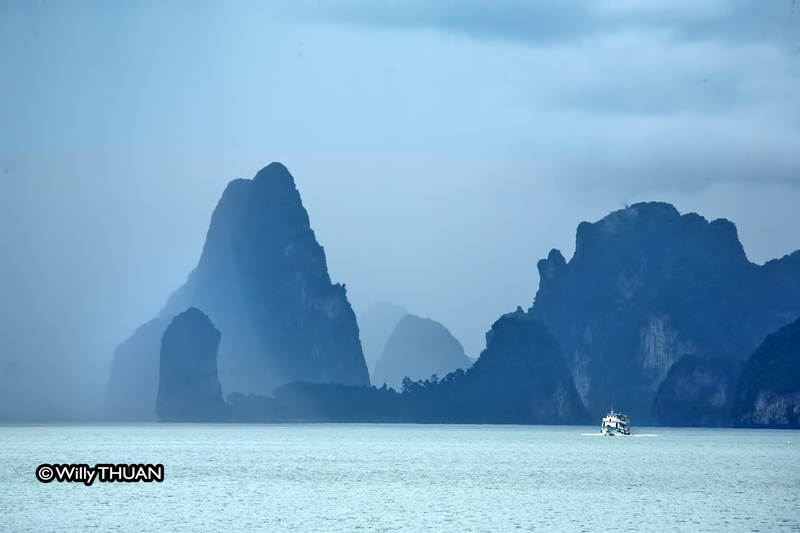 Sunny, cloudy or rainy: Phang Nga wears a different dress for each occasion. The easiest way to discover Phang Nga is simply to book a typical tour with your hotel. You will always have a fantastic day and you won’t have to worry about anything since all tours include transfer from and to your hotel. One of the fanciest way we explored Phang Nga was on a luxury cruise. It really added a surreal touch to the day, drinking chilled white wine on the deck and admiring the majestic cliffs rising high above our heads. Even better was the surreal kayak exploration with the famous John Gray Seacanoe, described with more details in our story “Hong by Starlight“. Kayaks silently glide in narrow passages with just the sounds of birds and cicadas over the soft noise of the paddlers. It takes you into a magical landscape totally out of this world. A weekend aboard the famous June Bathra Chinese junk was definitely the most exotic of all, gazing at bright stars in a clear night sky above our heads, lying on comfortable cushions set on the top deck. The most memorable moment was to be in the almost total darkness, quietly drifting by those gigantic dark limestone rocks of Phang Nga obscuring the star lit skies. The immense limestone cliffs standing everywhere in the bay are the main attractions. You saw them in movies, even in Star Wars and James Bond. Phang Nga has some landmarks, more or less attractive, but places are famous for a reason. The best known is the intriguing ‘James Bond Island‘ famous for a movie that most people nowadays haven’t even seen, called ‘The Man with the Golden Gun’. Boat rides and day trip tours are very easy to book from your hotel, often including transfers from and to your hotel and lunch. However if you have a car it’s a lot more exciting to do it on your own. Drive to the Surakul pier in Phang Nga where you can join any longtail boat. You can even rent your own, which is best, but certainly not the cheapest. Driving from Phuket to Phang Nga is fun. The road passing by Phang Nga town, more of a discreet small village, it lined by the same incredibly high cliffs covered with dense vegetation. At the intersection of Phang Nga Town and Krabi road, a beautiful park hidden from view reveals a small intricate maze of caves well paved and fun to explore. The park is very popular with locals who enjoy a picnic near the cave, so you can expect to see food and drink vendors are all around the place… It’s a nice little stop, but watch out the naughty little monkeys would be more than happy to eat your sausages.